Looking for a unique experience to get those crowds to your booth? 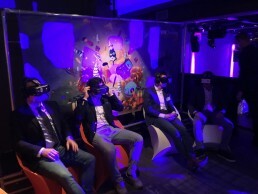 The VR Dining Games – Exposition Edition offers a small set-up with a huge attractive force. This version offers all social, multiplayer events and is suited for small and large venues.